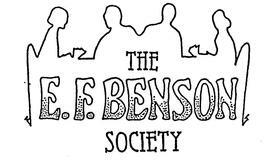 The E.F.Benson Society was formed in 1985 and held its inaugural AGM at the Royal Festival Hall. It is run by its elected Officers and Executive Committee, but all members are actively encouraged to help in whatever way they can. Over the years the Society has visited many places of Benson interest, including; Wellington College, Winchester, Cambridge, Horstead Keynes and Tremans, Marlborough and of course Rye. The latter it visits every year in July. In 1990 the Society commemorated the fiftieth anniversary of E.F.Benson’s death, with a service in St. Mary’s, Rye and also a Dinner and Musical evening at Lambeth Palace. The latter being a Benson home. In 2010 the Society celebrated its Silver Jubilee with a Concert in Rye Church to help raise monies for the restoration of the Benson West Window. This was an evening of Words and Music to celebrate Benson’s life, it being held on his 143rd birthday. Members of the Society had already given over £2,000 to the project and the Concert raised a further £1,800. The Friends of St. Mary’s co-ordinated the restoration work, which is now complete. The window is now secure for future generations. Later in the year the Society was allowed an attended Evensong at St Paul’s Cathedral, a Benson place of worship, followed by dinner in the Guildhall. In 2013 our President for over twenty years, Gwen Watkins, decided to retire having given devoted service to the Society in her series of Talks, research and books, and the Society were delighted and honoured to have the Rt Revd and Rt Hon Lord Williams of Oystermouth, become President. Lord Williams is currently Master of Magdalene College, Cambridge, having retired as Archbishop of Canterbury and is thus more than aware of the world in which the Bensons moved. Each year in April the Society publishes its journal, the Dodo. This has articles on the Benson family and also some short stories, based on the famous Benson Tilling characters. The Dodo also reprints some of Benson’s essays and short stories. As a member you can write about an aspect of E.F.Benson that appeals to you, or a Benson related subject and send your article to the Editor of Dodo, currently the Secretary, Allan Downend. The Society has also published collections of essays by E.F.Benson, and also the biography of the family by Betty Askwith and a collection of essays about the family and their circle by our President, Gwen Watkins. In 2010 we published the unpublished biography of Mary Benson by Arthur Benson. Most members of the Society come to an interest in E.F.Benson through Mapp & Lucia, and its activities reflect this. However, it does, look at all aspects of E.F. Benson; his character, circle of friends, and his interesting life. Some events also look at other members of the family and aim to develop our knowledge of them. The Secretary leads walks round the Benson sights in Rye during the summer ( see Rye Walks ) and also gives talks about E.F.Benson life and works. The Society holds out of print Benson books for sale and also the Society’s own publications, (see Books for Sale). Having celebrated twenty five years, we feel this shows what an interest there is in Benson and also great enjoyment. It is hoped you will want to join us and meet other E.F.Benson and Mapp and Lucia enthusiasts – just use the contact page and we wait to hear from you.